Here we attempt a more satisfying victory over the Stuart Unsolvable #40, by using the pattern reductions of the first pattern sets to add new pattern sets, moving closer to the full Pattern Overlay Method. This series of posts on LPO demonstrates it as a way to bring systematic order and human access to POM, a method that Logic of Sudoku pictures as chaotic and confusing. I expect Mint Jellies will approve of this message. After the first round of LPO, the follow up with reduced patterns of 6, 8 and 9 did very little damage to remaining patterns. In fact, only two 1-candidates, one 7-candidate, and two 3-candidates were eliminated, leaving the grid below. The blue/green cluster, and the reduction to one green pattern and two blue ones made for a powerful bifurcation. 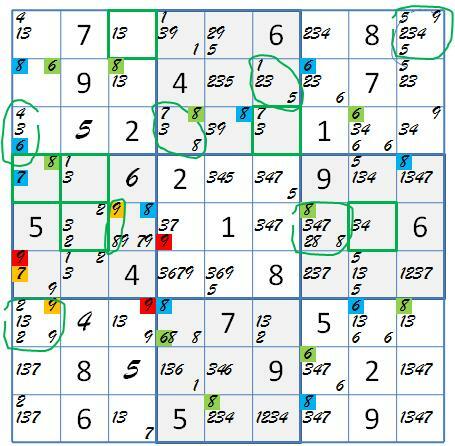 This is “Sudoku speak” for two possible solving routes, one of which must be correct. Sure enough, the solution was achieved without difficulty. But did we miss anything we could have learned about LPO? Well, yes. In the previous post, we had a look at completing the search for orphans in a difficult case. This led to a systematic method, requiring only a little more patience, which is comprehensive, i.e., guaranteed to find any orphan. This method was not revealed by the simpler cases from Andrew Stuart’s The Logic of Sudoku that we analyzed earlier. The removal of two 1-candidates left us with a large, but possibly feasible number of patterns. Remarkably, there is now an orphan 1-candidate at r7c6. Back on the grid, the removal of this orphan has no immediate follow up. 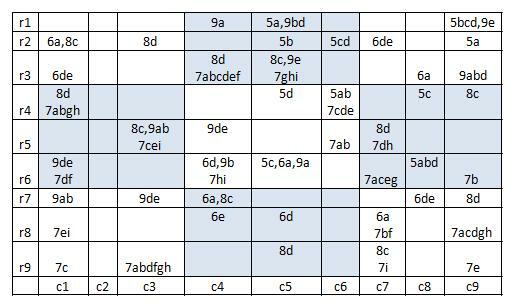 The single removal of 7 in r4c3 trims the 7-patterns to 9. It is interesting that we already know that patterns 7abgh are blue and patterns 7df are orange. 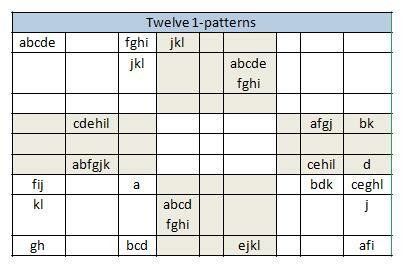 On the overlay of 7 patterns on our previous set, we concentrate first on conflicts with remaining patterns 8c and 8d. 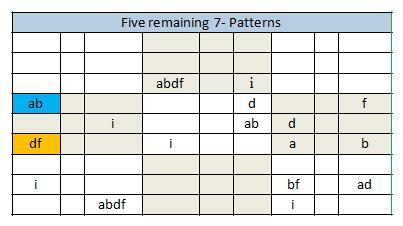 A simple tally from the worksheet shows that 7-patterns c, e, g and h conflict with both 8-patterns, leaving 5 7 patterns. By further tallying against 5, 6 and 9 patterns, I found no pattern removals, and that 7i => 9d and 7d => 5c or 5d. I checked back over the resulting grid, bv map and X-panels with no luck. I found no cluster or AIC hinge extensions. This post is getting too long, and perhaps you’d like to continue with the 1-patterns, our last LPO shot at Unsolvable 40. The 1-freeform panel is way too busy for reading, so here is a corresponding letter assignment panel. This entry was posted in Extreme Solving and tagged add patterns, LPO, sudoku POM, Unsolvable 40. Bookmark the permalink.